“Hot” Off the Press!!! Zestfest 2015 Winners Announced!!! At tonight’s Zestfest awards ceremony, companies from all over the country were awarded the coveted Golden Chile award!! Thanks to John “CaJohn” Hard for sending the list out to myself, Scott Roberts, and Al “Buddah” Goldenberg to spread to those waiting with baited breath to know if their spicy works of love made the judges smile, sweat, or whatever else judges do!! So look for your favorites, and maybe order something from a winning company and see if you agree!!! Why, you ask? Because, Ladies and Gentlemen, It’s a Fiery World!!!! Best New Product Consumer Ready Food 1. Georgia’s Sweet Peppers – Candied Habanero 2. Texas Brew Salsa – True Blue Love Confit 3. Feisty Parrot – OUCH! Extract Some Heat and Check out Ken’s Fiery World on Scott Robert’s Weekly Firecast Episode #60!!! Scott chats with one of the most influential people in all of barbecue, Famous Dave Anderson of the Famous Dave’s BBQ restaurant chain. Ken Alexander also stops by and has an in-depth discussion with Scott about capsaicin and chile pepper extract. Scott reviews Jersey Barnfire Original and Black Garlic Hot Sauces. Cajun Heat “Q’s” Up a Winning Sauce!!! I have the privilege of telling all of you about a new sauce I had the honor of trying prior to its public release. 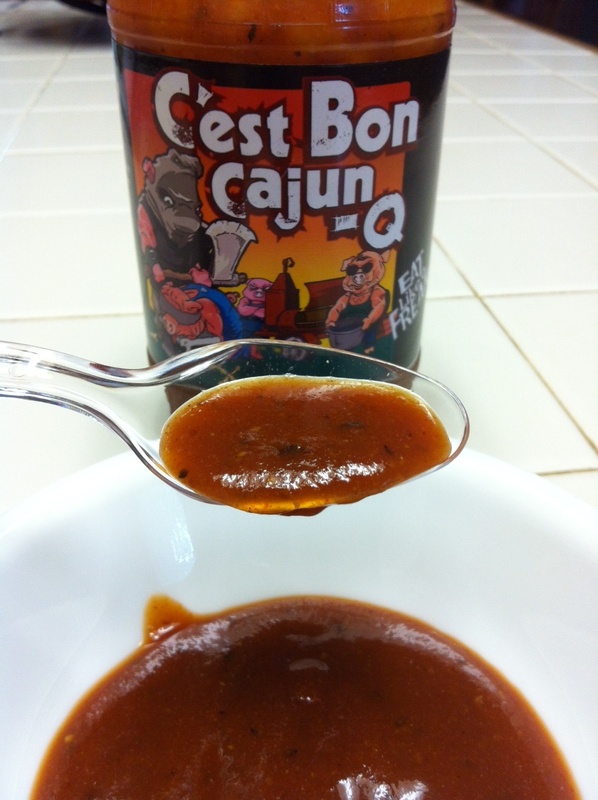 Clement Bourg, saucemaster deluxe, and owner of Cajun Heat (home to Voodoo Ash and Liquid Napalm), has crafted a BBQ sauce with his native Cajun roots called “C’est Bon Cajun-Q”. I recently saw a post Clement put on Facebook asking if anyone knew a writer who could help him re-write his product sheet. Well, I like to write, so I fired back a quick response and told him I’d love a shot at it. And I was tickled that he liked what I did for his product descriptions. But not being a “professional” writer, I wasn’t sure what to charge him after he asked my fee. So we did the logical thing – we bartered our talents! I think I ended up with the better end of the deal, for sure, because Clement not only hooked me up a great assortment of products to try and enjoy (see the picture! Jealous, huh?! ), including stocking me up on Ash and Napalm, my two fav Cajun Heat products, he also sent me his new C’est Bon Cajun-Q BBQ sauce to review. And, if that weren’t enough, he sent me his Batch 1, Bottle 1of C’est Bon, and Batch 1, Bottle 2 with Cajun Heat’s gourmet label scheme (same sauces, different label for a different audience). How cool is that? I know Vic Clinco is drooling over that one! So, with that little story as the lead in, let’s see what’s up with Clement’s newest creation. Appearance/Texture: This is an interesting looking sauce, with lots of character. The color is light for a BBQ sauce, almost a rusty brick red, not the deep, dark look of many BBQ sauces. I attribute this to the lack of Molasses in the ingredients. It is full of specks of spices, all of which serve to paint a spicy canvas which advertise the diversity of flavors inside. It is like a natural silk garment…it lays on the tongue with a good smooth drape, but with a touch of texture that speaks to the flecks of natural spices and goodness contained within its fabric. Flavor: This is where Clement has gone deep into the recesses of a gator infested bayou, and waded through the murky, cypress studded waters, and emerged with a sauce that is……wait for it…….obviously Cajun, no, wait……Carolina…..no, how about Country, no, that’s not it………. Caribbean, no that’s not it, either. So what is it? After all, it has Cajun Q in the name! Well, I think it’s all of the above!!! It took me a while to figure it out. It has the sweet of a country sauce, the zest and uniqueness of a caribbean, the tang of a good North Carolina vinegar based sauce, but with an unmistakable Cajun pop and flair! Thoroughly confused?! Don’t worry! It’s just the swamp gas and it’ll pass! This sauce is so eclectic in its spice blend that it could have many mommas and daddies in its heritage! The sweetness of the tomatoes, ketchup and brown sugar, with that touch of earthy smokiness and zingy spices found in cajun flavors, make a great foundation of flavor. Add in the mustard (both yellow and spicy) and the vinegar, and the flavors lighten up, the vinegar opening the palate and allowing the privileged partaker to experience the full impact of the worldliness that this sauce expresses. Given that Clement relocated to Virginia from Louisiana, I found myself thinking that he is paying homage to his roots and his new home, and all points in-between. Heat: This isn’t a hot BBQ sauce, nor does it advertise itself as such. It provides some pop from the vinegar, mustard and spices, but just enough to be playful. It truly works for any taste and any person. Label: Those of you that are familiar with my reviews on I Love it Spicy and Hot Sauce Daily know that I’m big on labels. Why? Because that’s the window to the soul of an initial product purchase. Why do you think companies spend gazillions of dollars every year on Madison Avenue type advertisers? So that manufacturers and business owners can showcase their products in the best visual light! 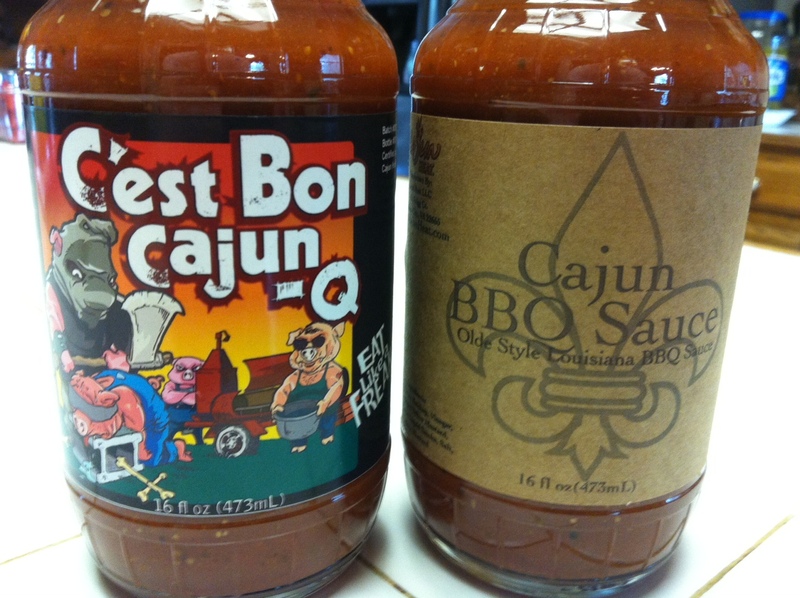 So what about Cajun Heat’s C’est Bon Cajun-Q label? Well, the label is eye-catching and fun. It reminds me of something frequently found in tourist shops. Cartoonish and bright! And Clement calls it a “novelty label”. But the company name is missing on the front of the label, and I think that hurts brand recognition. How are you going to instill customer loyalty if they don’t know what company is selling the product? The Cajun Heat tagline, “Eat Like a Freak” is clearly visible, but the company name and logo (which is well done and very polished) is pushed off on the side of the label. I think Cajun Heat would do themselves a favor by putting out a label that clearly displays the company name. As to Cajun Heat’s “gourmet” label, it looks generic and gives no real help to establishing identity of company or product. Overall: 4 1/2 Fiery Worlds : This is an excellent BBQ sauce. It’s complexity and diversity belie its name. And being that South Louisiana is my adopted adult home (I guess 30+ years here allow me that claim! 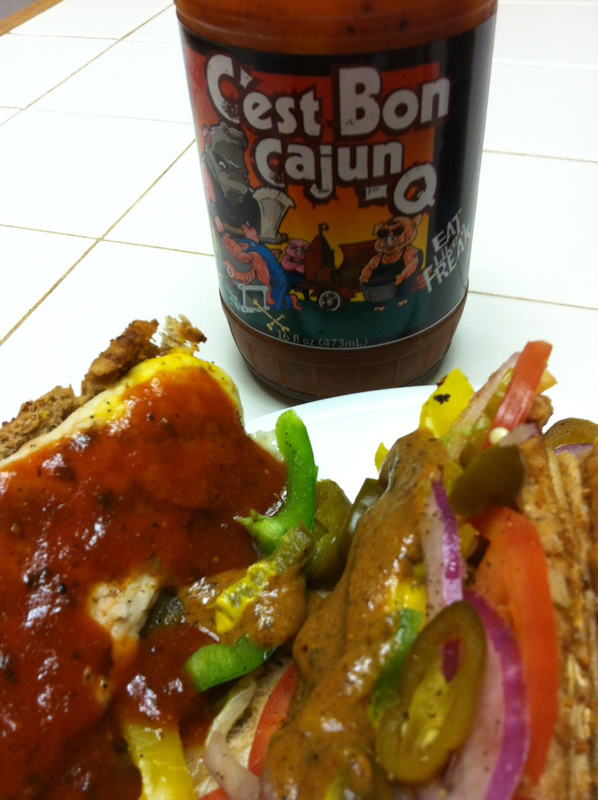 ), I am proud that Cajun Heat’s C’est Bon Cajun-Q proclaims a Cajun identity. However, it could rightfully claim an idenity in any of the BBQ Capitals: Memphis, St. Louis, Kansas City, North Carolina, etc. etc. etc. It’s just that diverse. I’ve had it on several different things, including chicken, pork, and even on my oven roasted chicken Subway sandwich, along with Cajun Heat’s mustard! If you’re BBQ loving family and friends can’t decide on a style of sauce to use at your next BBQ feast, this sauce may very well satisfy even the most loyal of sauce style followers!! If you’re in the Stephens City, Virginia area, give Clement Bourg of Cajun Heat a shout. Or check out his website to pick you up some today. You definitely won’t be sorry. And don’t forget: Explore the spice in your life because It’s a Fiery World! Thanks for stopping by! PostScript: This review is posting on Clement Bourg’s birthday, April 27, 2012. To promote the launch of C’est Bon Cajun-Q, Cajun Heat is offerering a discount to all early purchasers. Put in the coupon code CAJUN-Q, and receive a 35% discount for all Cajun Heat orders placed Friday, April 27th!! Cajun Heat’s website highlights their entire line of cajun inspired products. They also feature two different labelling schemes for their hot sauces and BBQ sauce. 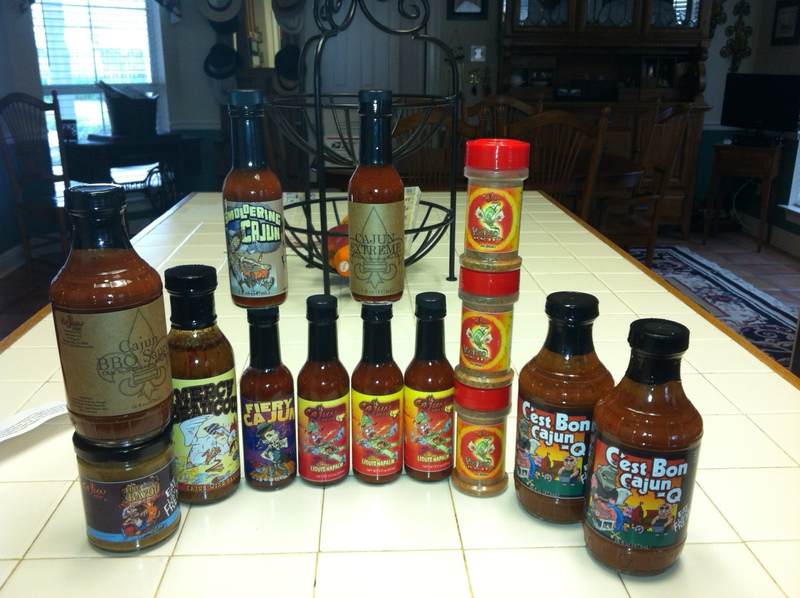 Their product line includes the popular Voodoo Ash spicy seasoning and their hottest sauce, Liquid Napalm! They also feature a wing sauce, three different cajun hot sauces of varying heat levels, a cajun mustard, and of course, C’est Bon Cajun-Q! Bon Appetit!! !